Hi friends! Today I'm sharing with you a notepad I created using the Starburst Framelits Dies and the Paper Pumpkin set Memo Medley. You know I enjoying making notepads and I haven't made one in awhile so I thought I would create one...these are so easy to do. All you need is a notepad and your imagination! So I started with the Decorative Dots TIEF and some Pistachio Pudding cardstock to emboss my cover for the notepad. The Memo Medley set has 3 stamps in the set (notes, all out of and to do)...I wanted to use the notes stamp. By the way if you are a Paper Pumpkin subscriber you can purchase more of the paper and accessories that came with the previous kits through the end of this month...and there is still time to sign up and get a pack of FREE markers with a new subscription. 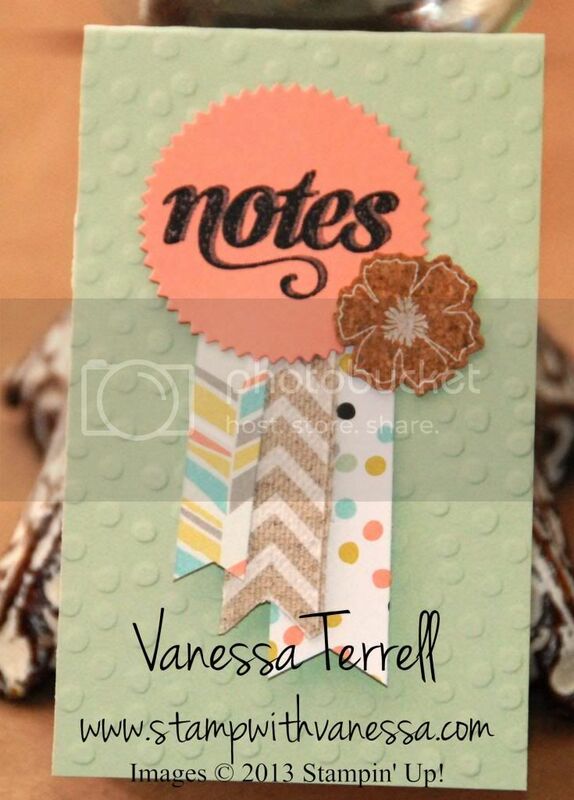 Back to my project...I stamped notes on Crisp Cantaloupe cardstock and cut it out using the Starburst Framelits dies. Here is how my project turned out...leave me some comments and let me know what you think!